Cassidy is truly a ray of sunshine. Her smile is infectious, and beyond being beautiful, her personality and wit are warm and genuine. She makes everyone who spends time with her feel welcomed and valued. Next up for Cassidy is Whitworth University in Spokane Washington. As a member of their cheerleading squad - along side her older sister - Cassidy is excited to live on campus and explore all that this small, private University has to offer. this girl is SMART too… don’t you go thinking she’s just a pretty face. She’s going places fast, and she is unstoppable! 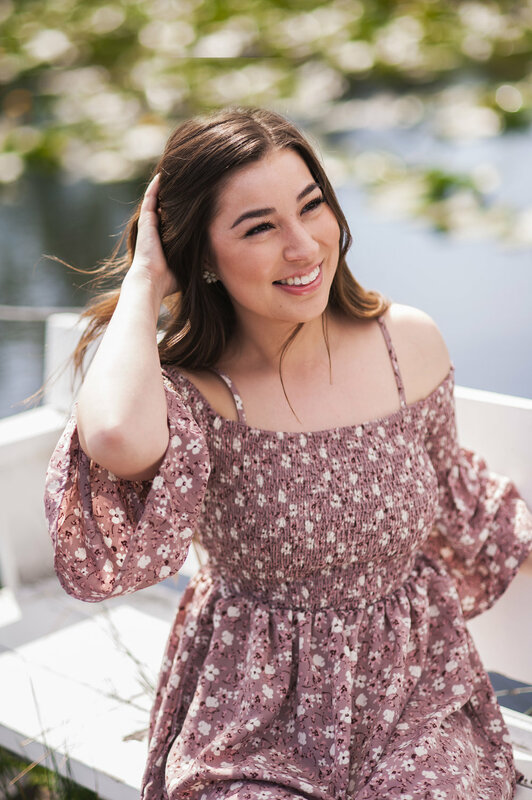 Cassidy’s family lives near a wonderful little lake, and we took advantage of the warm weather, and clear sunny day to take some casual senior portraits with and without her cap and gown. The soft rose color in her first outfit is beautiful against her olive complexion and dark hair. The classically feminine white dress she chose for her second outfit was great against the flowering bushes that were growing around the lake. Cassidy was voted Prom Queen, and it’s not hard to see why! We made sure to get a couple keepsake shots of her in her sash and crown. It’s so important to memorialize those important moments in your seniors life - these things are a big deal and should be celebrated. Having a professional portrait taken is so much better than only having a few cell phone shots to look back on! We finished up Cassidy’s session with a few images in her cap and gown. It’s hard to make a polyester sack look good, but some how Cassidy managed to make it work!